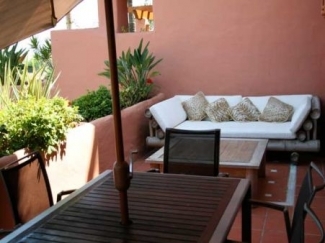 This is a superb and luxurious penthouse apartment, situated on the popular Cabo Bermejo complex beside the sea front. Only 2 hours far away from Sierra Nevada, between San Pedro & Estepona. 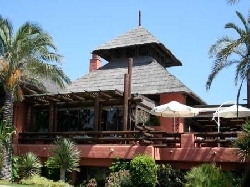 Near to Selwo Safari Park, the luxury 5 star hotel Las Dunas and well know restaurant on the beach Tikitano. 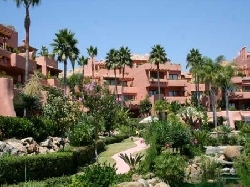 It is generally accepted as the most prestigious new development of luxury apartments on the Costa del Sol near Marbella. It is located in the middle of the New Golden Mile, midway between Marbella and Estepona and only a 7-minute drive to Puerto Banus. Next to the Cabo Bermejo resort is the renowned Las Dunas 5-star hotel and an 800-year old Arabian watchtower. There are beautiful views across the Mediterranean to Gibraltar and Africa. The private gardens are of a tropical design with waterfalls and cascades throughout leading into two lakes, which border 2 large pools with sun loungers and a shaded seating area with drinks and snack machines. Each pool has its own showers, saunas, gyms, toilets and lifeguards are on duty during the high season. 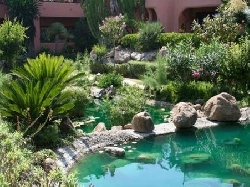 The 2 well-equipped gyms are air-conditioned and overlook the pools and gardens. The grounds are illuminated at night. 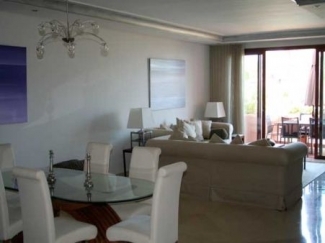 Marbella and the famous Puerto Banus (playground for the rich and famous) are close at hand with abundance of restaurants and bars to suit every taste. Marbella has great beaches, a great climate and wonderful food, nightlife and entertainment - but also historical remains dating from Roman times, and more modern attractions, such as the Museum of Contemporary Spanish Engravings.